Aluminum diamond plate has high strength, good weldbility and resistance to correction, so it is highly suitable for manufacturing anti-slip floor, staircase, boat deck, etc. 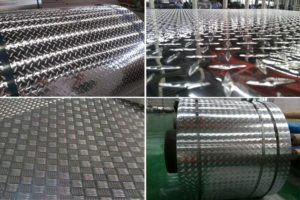 What’s more,aluminum checker plate is easy to clean with high brightness, so it can also be vastly used in construction filed, especially for interior decoration. Aluminum diamond plate of haomei aluminium. mainly includes 1xxx, 3xxx, and 5xxx series. Among these, the most common alloy is 3003, 5052 and 6061. The thickness is from 0.8mm to 7.0mm, width range is 100mm-2600mm, and length is from 500mm-16000mm. Besides, we can manufacture uncommon specifications at customers’ need. Moreover, all of our aluminum diamond plate live up to national standards, such as AMS and JIS. So quality can be guaranteed. According to Google trends, aluminum diamond plate crush in 2005, and since then, lots of manufactures rise up like grass after rain. After two-year hot period, the production of aluminum products increased sharply. which means we always stay ahead of other factories all those years. Even during the hot period, haomei aluminium can still share a large part of market. With the improvement of people’s living standard, more aluminum products will enter our life for its eco-friendly. So we should take a positive attitude towards the prospect of aluminum checker plate.